One of the great short stories of the 20th century is Nobel Laureate Isaac Bashevis Singer’s The Spinoza of Market Street. It tells of an aged scholar who has devoted his life to the study of Spinoza’s great work, Ethics. Protagonist Dr Fischelson has lost his library job and, like his hero, been expelled from his religious community for his heretical views. Looking down from his garret with disdain at the crowded street below him, he devotes his days to solitary scholarship. At night he gazes up through his telescope at the heavens, where he finds verification of his master’s wisdom. Then one day Dr Fischelson falls ill. A neighbor, an uneducated “old maid,” nurses him back to health. Eventually, though the good doctor never understands exactly how or why, they are married. On the night of the wedding, after the unlikeliest of passionate consummations, the old man gazes up at the stars and murmurs, “Divine Spinoza, forgive me. I have become a fool.” He has learned that there is more to life than the theoretical speculations that have preoccupied him for decades. The history of modern physics boasts its own version of Fischelson. His name was Paul Dirac. I first encountered Dirac in physics courses, but was moved to revisit his life and legacy through my service on the board of the Kinsey Institute for the Study of Human Sexuality and teaching an undergraduate course on sexuality and love. Born in Bristol, England, in 1902, Dirac became, after Einstein, the second most important theoretical physicist of the 20th century. He studied at Cambridge, where he wrote the first-ever dissertation on quantum mechanics. Shortly thereafter he produced one of physics’ most famous theories, the Dirac equation, which correctly predicted the existence of antimatter. Dirac did more than any other scientist to reconcile Einstein’s general theory of relativity to quantum mechanics. In 1933 he received the Nobel Prize in Physics, the youngest theoretical physicist ever to do so. 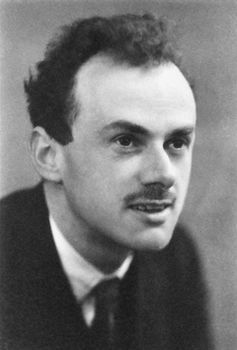 At the time Dirac received the Nobel Prize, he was leading a remarkably drab and, to most eyes, unappealing existence. As detailed in Graham Farmelo’s wonderful biography, The Strangest Man: The Hidden Life of Paul Dirac, Mystic of the Atom, on which I rely heavily in this article, Dirac was an incredibly taciturn individual. Getting him to utter even a word could prove nearly impossible, leading his mischievous colleagues to introduce a new unit of measure for the rate of human speech, the Dirac, which amounted to one word per hour. Dirac was the kind of man who would “never utter a word when no word would do.” Farmelo describes him as a human being completely absorbed in his work, with absolutely no interest in other people or their feelings, and utterly devoid of empathy. He attributes this in part to Dirac’s tyrannical upbringing. His father ruthlessly punished him for every error in speech, and the young Dirac adopted the strategy of saying as little as possible. Then one day, something remarkable entered Dirac’s life. Her name was Margit Wigner, the sister of a Hungarian physicist and recently divorced mother of two. 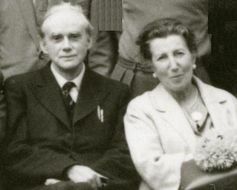 She was visiting her brother at the Institute for Advanced Study in Princeton, New Jersey, where Dirac had just arrived. His personality could scarcely have contrasted more with hers: to the same extent that he was reticent, measured, objective, and cold, she was talkative, impulsive, subjective, and passionate. A self-described “scientific zero,” Manci embodied many things that were missing in Dirac’s life. After their first meeting, the two dined together occasionally, but Dirac, whose office was two doors down from Einstein, remained largely focused on his work. I am afraid I cannot write such nice letters to you – perhaps because my feelings are so weak and my life is mainly concerned with facts and not feelings. You should know that I am not in love with you. It would be wrong for me to pretend that I am, as I have never been in love I cannot understand fine feelings. Yet with time, Dirac’s outlook began to change. After returning from a visit with her in Budapest, Dirac wrote, “I felt very sad leaving you and still feel that I miss you very much. I do not understand why this should be, as I do not usually miss people when I leave them.” The man whose mathematical brilliance had unlocked new truths about the fundamental nature of the universe was, through his relationship with Manci, discovering truths about human life that he had never before recognized. Manci, my darling, you are very dear to me. You have made a wonderful alteration in my life. You have made me human… I feel that life for me is worth living if I just make you happy and do nothing else. In Dirac, a thoroughly theoretical existence acquired a surprisingly welcome practical dimension. A man who had been thoroughly engrossed in the life of the mind discovered the life of the heart. And a human being whose greatest contributions had been guided by the pursuit of mathematical beauty discovered something beautiful in humanity whose existence he had never before suspected. In short, a brilliant but lonely man found something new and wonderful that had been missing his entire life: love. As my students and I discover in the course on sexuality and love, science can reveal a great deal, but there are some aspects of reality – among them, love – that remain largely outside its ambit. The author of this article Richard Gunderman is Chancellor’s Professor of Medicine, Liberal Arts, and Philanthropy, Indiana University. This article was originally published in The Conversation under a Creative Commons Attribution No Derivatives license. Read the original article here. Paul Dirac introduced some useful formal tools (such as his notation for integrals and operators). One of them is the Dirac delta function δ(x), an object then unknown to mathematicians, which turned out to be very useful in physics. The book Ideas of Quantum Chemistry, 2nd Edition, has an excellent appendix that describes the Dirac Delta Function. We are pleased to offer you a download of this sample from the book. If you are interested in more from the Ideas of Quantum Chemistry, 2nd Edition you can order a print copy at up to 30% off the list price and free global shipping via the Elsevier Store. Enter discount code STC215 at checkout. One of the oldest scientific disciplines, the study of physics continues to expand the scope of human understanding, from the nano-scale to the dimensions of our universe. Elsevier’s extensive collection of physics books, journals and resources represents the expanding nature of this deep, wide, and interdisciplinary field. We offer major reference works, textbooks, monographs, series, and handbooks covering areas such as optics; atomic, molecular and plasma physics; condensed-matter physics; non-linear, statistical and applied physics; and surfaces and interfaces. Mars explorers, take your vitamins! Advances in Imaging and Electron Physics Celebrates Its 200th Volume!